» Component Reviews » EVGA GTX 970 4GB Review, The Best Graphics Card For 1080p? « What Is A Good Anti Virus Program For PC Builds? EVGA GTX 970 4GB Review, The Best Graphics Card For 1080p? For today’s post I’m going to review the EVGA GTX 970 4GB graphics card. Some say that it’s the best card for 1080p, but does it really deliver? I ask if it delivers because when the GTX 970 series cards were first being released and people checked the specifications of it with different programs some people found that the card doesn’t actually use all 4GB of the video memory, people were saying that it only uses 3.5GB of the video memory. Through my personal research, I’ve come to find that the 970 is indeed able to use all 4GB of the VRAM, it’s just that the last 0.5GB is accessed a lot slower than the rest of it. The Best Graphics Card For 1080p? This card is definitely the best graphics card for 1080p in comparison to the others that are also ideal for a high quality, 1080p resolution experience. In most cases, when it comes down to raw performance, a 4GB 970 out performs even an 8GB 390 at 1080p. It really depends on the game – but most games perform better at 1080p with the 970 based on the benchmarks posted online. Even with the partitioned 0.5GB of VRAM, it’s still the best choice for 1080p. The card actually doesn’t really ever use the full 4GB at that resolution. In comparison with the 390 in Just Cause 3 at a 1080p resolution you’ll see that they have similar performance most of the time but when there is a ton of action going on, the 970 clearly performs better than the 390. With the 970 being cheaper than the 390 most of the time, that’s what makes it the better choice. The video below goes into detail as to how the 970 performs better than a 390 with Just Cause 3 at 1080p. But again, when it comes to higher resolutions such as 1440p or 4k then the 390 is definitely the better card. So if you’re planning on venturing into higher resolutions then you should definitely pick up the 390 instead. But for 1080p gamers, the 970 is the way to go. nVidia’s GeForce Experience application states that the 970 that I have, which is the same one pictured above (The ACX 2.0 version), is suitable for the virtual reality industry. nVidia Geforce Experience tells me that the GTX 970 is good to go for all of their main features! I’ve also done a test with Steam’s VR test and I had a very smooth frame rate throughout the entire test which was sort of a Portal atmospheric benchmark software for testing towards Steam’s Vive. At the end of the test I was rated green meaning that I would have a high quality experience with the current specs that I have. Keep in mind that I also have a i7-4790k as my processor which is also another important component to have in the realm of virtual reality. Something like a higher end i5 is what is needed for a quality experience. Then a GPU such as the 970 would be most ideal. It’s also compatible with everything else which includes the game optimizations, GameStream with the Shield, ShadowPlay for recording etc. The only thing that it isn’t compatible with within GeForce Experience is the LED customization. For some reason it states that it’s indeed compatible with it but the GPU doesn’t light up at all. I was sort of confused at that since it says that it can when in reality it can’t, but oh well. It’s the performance that is most important. If the amount of noise that a video card produces is important to you then you’ve got to know that this version of the 970 is one of the most silent cards on the market. Reason being is because it was literally designed with the noise level in mind. It has a built in Db Noise Inverter which keeps things super quiet and with the ACX 2.0 technology, the fans actually don’t move at all when it is under 60°c, resulting in no noise at all. EVGA did an excellent job with the guts of the ACX 2.0 970. The noise level of an overall PC is a big deal and I was very happy to see that EVGA literally designed it with that in mind 100%. 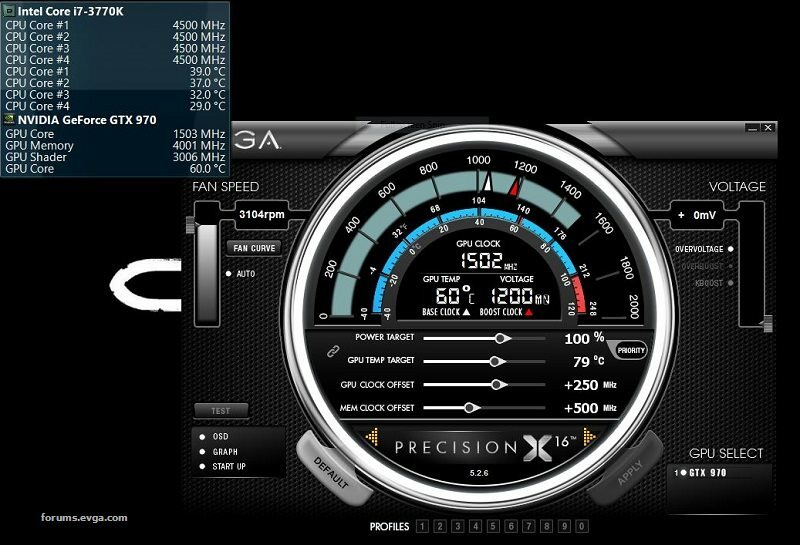 I personally have not messed with any of the overclocking stuff when it comes to this card but in my personal research, doing so isn’t going to be hard at all. There is a program that EVGA created which you’ll be able to download and utilize with the CD that comes with the card and there are also many different 3rd party programs that some people like to use as well. When it comes down to overclocking the graphics card, you need to keep your temps in order and you really need to know what you’re doing. Most if not all motherboards will be able to pick up whether or not the GPU is too hot and if it were to get too hot, it’ll auto shut down to ensure that nothing gets damaged. I highly recommend watching a bunch of videos and going through tutorials online before even thinking about messing with the programs. Again, I’ve personally never messed with overclocking yet because I just haven’t had to quite yet. The stock settings does more than enough for every game that I throw at it to run smoothly. I’ve also read in many places that the GTX 970 is actually easier to overclock than the competition such as the R9 390. There’s also the fact that nVidia cards always consume a lot less power than AMD cards even after being overclocked on both sides – nVidia proves to own the area of power consumption. To sum up the overclocking for this, make sure you know what you’re doing before you venture deep into the overclocking programs. But feel comfortable knowing that this card is totally “overclock friendly”. I actually use this same exact card in my own build so I figured that I should probably talk about some different games and the overall performance levels for them. I tested out a few popular titles to get an overall feel for the FPS and what types of things make the FPS rating dip a little bit. Fallout 4 – On average I get 60 FPS. It’s not until I get in the very detailed area around Diamond City and/or having a bunch of action going on to where the game will dip below 40 FPS. There are a few areas in the surrounding area of Diamond City where I would reach a lower frame rate of around 30 FPS but given all of the stuff going on, that was sort of expected. In summary, 60 FPS 70% of the time. This is with all settings on ultra. Ark: Survival Evolved – This is a very demanding game and for good reason – it looks amazing. I get an average of about 40 FPS for the most part. When I’m around a big base then I start to see small dips sometimes even going into the 20’s but it never goes below 20 FPS. The low frame rate there is only there when there is a HUGE base, the game is very playable. I had the settings set to high which was what the game suggested for those with a GTX 970. Rocket League – 60 FPS, nothing less. Everything is set on ultra and the game runs extremely smoothly 100% of the time. Great looking game, the 970 does it justice. Tom Clancy’s Rainbow Six: Siege – I have the graphics settings set to ultra and I have a steady 60 FPS for the most part. I played a single player mission and a multiplayer match, both resulting in a solid 60 FPS rate even while breaching a door with C4. I did notice very small dips in FPS when a whole lot was going on in the realm of multiplayer, but it wasn’t anything that was super noticeable or anything. This 970 out performs a R9 390 in most cases when it comes down to the nitty gritty action in games, it’s extremely quiet and you get the most out of your buck with 1080p gaming in mind. At the end of the day, raw performance is what matters most. If you already have or plan to game at a higher resolution than 1080p then this card wouldn’t be as ideal as say the R9 390 for more VRAM would be extremely useful for those higher resolution displays and a card with more VRAM is the most ideal route to go with. So, are you going to be picking up the GTX 970 after reading this review? Or are you planning on gaming at an even higher resolution? Tagged best graphics card for 1080p gaming, evga gtx 970 4gb video card. Bookmark the permalink. 6 Responses to EVGA GTX 970 4GB Review, The Best Graphics Card For 1080p? 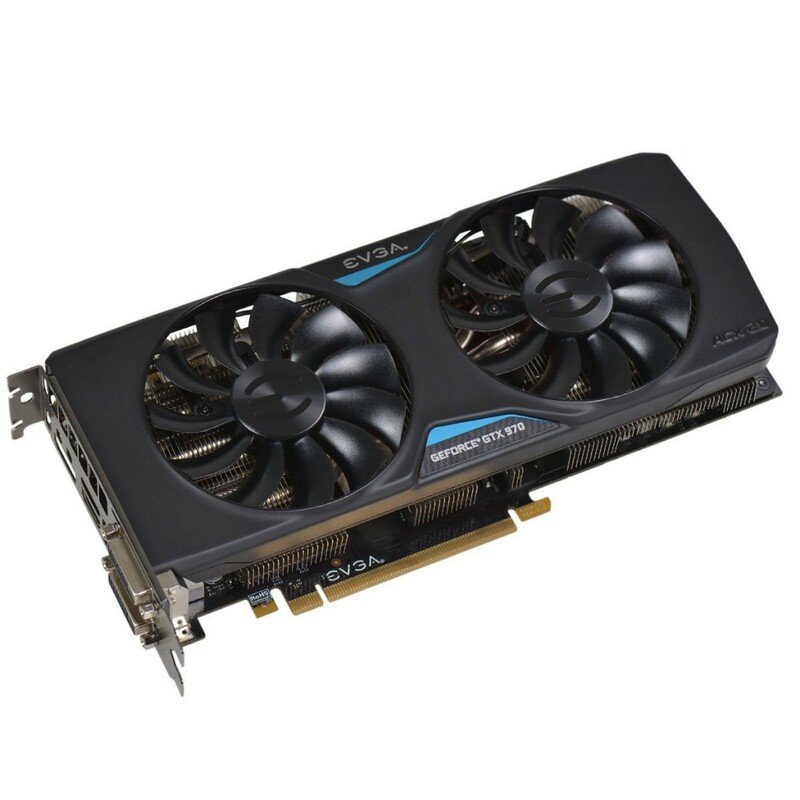 Would you say this card is overall better than the Gigabyte GTX 970 or are they around the same? The only real difference between this and a Gigabyte 970 is that the Gigabyte 970 (G1 edition) has a bit more overclocking room. With that though, this one has higher clock speeds at stock settings… so the Gigabyte card would be more ideal for overclocking enthusiasts who are looking for the best overclock card. For those that aren’t super into overclocking or don’t plan on really messing with it then the EVGA card is definitely the way to go. Awesome! I don’t plan to overclock at all with this build, so I will definitely be getting this card! Interesting to see that this was, according to you, the best GPU for 1080p, and also at the time it cost $335, while now not only is it about $400, but there are newer cards that are similar performance for cheaper. The RX 480 should receive about, if I’m correct, 970 performance for $100 less for the “best model”, the Sapphire Nitro something or other. Just a note, I saw that as a review on Amazon, and while I think it’s most likely true, there is the chance it isn’t. And even if it was the price you listed here, you’d still save $30 or so. Quite great when new stuff comes round, it seems. Also, 1060 should be similar. I just haven’t done much research into it, since I don’t have any plans to go with it. There is a pretty much 100% chance I’ll be going with the 480, so I haven’t seen much need to research much into the 1060. Nothing wrong with Nvidia, just a choice I decided to make. Yes, I understand at the time you made this review it was true that it was the best for 1080p to you, I’m just mentioning how it is now. In case other people are considering going with this, not knowing about new stuff. And also because I just want to mention it. Yup, times change. This was the #1 1080p card at the time that I wrote this many, many months ago and I agree – the ideal upgrade from this would be something like the 1070 or even a 1080 if the PC’s CPU doesn’t bottleneck with it.